Another Friday....Another Bloggers Challenge. This weeks challenge is a sketch challenge - while flipping through on of the Stampin' Up! Stampin' Success magazines, I came across a sketch I thought would be fun to incorporate into one of the weekly challenges. I'm not good at drawing sketches, but love to use them in my designs. First, I should tell you, I really took creative liberties with this weeks sketch, but I assure you, it was my jumping point for this weeks card. When you scroll down through this post - you'll see the sketch as it was originally presented, then you'll see the flipped version of the sketch - they way I used it in my design. No stamping on my card this week either, I used the Big Shot, Texturz Plates, Top Note and Flower, Daisies # 2 Die. 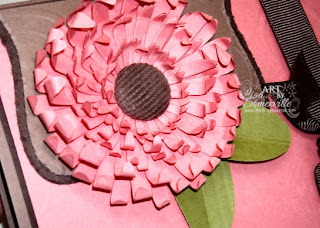 The flower that I created with the Daisies Die was inspired by the ones my friend Jeannette posted here - be sure to check it out she's got an awesome tutorial. (Shhh don't tell her, but I left off one of the flower layers, I used 3 of each one not 4). After creating the flower, I added one of the new Corduroy Buttons as my center. Ran some Olive card stock through my Texturz plates, punched with the Large Oval punch and added them under the flower for leaves. The panel behind the mum was cut from Close to Cocoa and Chocolate Chip card stocks, cutting the edge off the Close to Cocoa piece, then running the Cutter Kit on both pieces. In place of the sentiment from the original sketch, I decided to add the Chocolate Chip Grosgrain tied using the One Hole Bow Technique - this is great for keeping your bows securely in place. The Cameo Coral piece of card stock has also been run through the Texturz plate, it's just not showing well in this photo. Thanks for stopping by! Be sure to stop back tomorrow - the Starving Artistamps Design Team is having a Blog Hop! Wow Lisa...love that beautiful bloom and you crated it in such a striking shade! The sketch rotation really spoke to me and your incorporation of the bigz die cut is inspired! Fantastic job as always! Beautiful! Love those corduroy buttons. Great color combo too. This is a stunning card! Love how you flipped the layout and that flower is so cool! Sweet card! Hey Lisa! The flowers turned out great! These are too much fun to make aren't they? Great take on the challenge, Lisa, just love that flower. Beautiful! Love your paper flower! Very nicely done, clever with no stamping. Love the colours. Wow! Wow! Wow! WOWZERS!!! This is AWESOME! STUNNING!! Beautiful! breathtaking! Beautiful, Lisa! That die is on its way to me, can't wait to use it! Great job. Beautiful flower! Great take on the sketch too. So pretty! I am waiting for my Daisy die to get here. Now, I want to make one just like this!! Wow Lisa! I love how you made that bloom, and the button adds so much depth. This is really stunning. I like that you used the top note die. instead of a circle. It's really great. WOW Lisa, this is gorgeous! That flower is amazing. I will have to give it a try! You never cease to amaze me with your flower creations. This one is no different, it's absolutely stunning! Gorgeous card Lisa! I love that corduroy button...now I really can't wait for mine to get here! You ripped out another beauty...love the crimping on the card...and especially your choice of colors..that hot pink sings off the page. 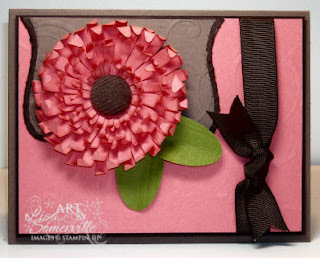 Love the pretty 3-D flower, Lisa! What a gorgeous flower!! - Love how you flipped the sketch. I will be saving the flipped sketch as well after seeing your wonderful card. Now THAT'S a "WOW" card! Totally cool flower! OMG!!! I love it!!! AND that flower is just awesome!! Simply stunning, Lisa. Love this flower and thanks for including the link to J's tutorial. Great job on this challenge! Fabulous card! LOVE that flower....and to thing I ddn't NEED that die! Great idea to use the Top Note Die here!